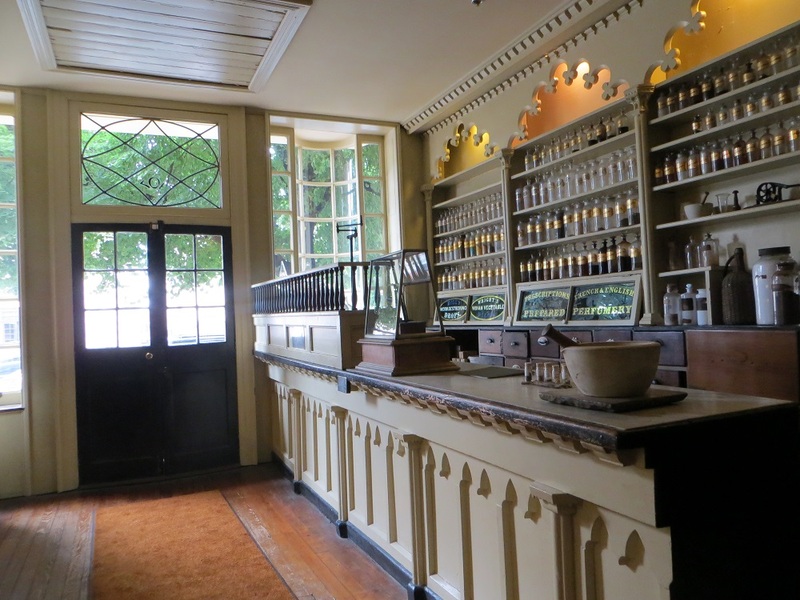 “Do you know what castor oil is for?” asked our guide at the Stabler-Leadbeater Apothecary Museum in Alexandria, Virginia, where the note from Mrs. Washington was exhibited. “Exactly. We don’t know whether it was for Mrs. Washington or for a member of her household. But if it was for her and she took it, it didn’t help. She died exactly a month later, on May 22.” Of a “severe fever” according to biographer Patricia Brady. 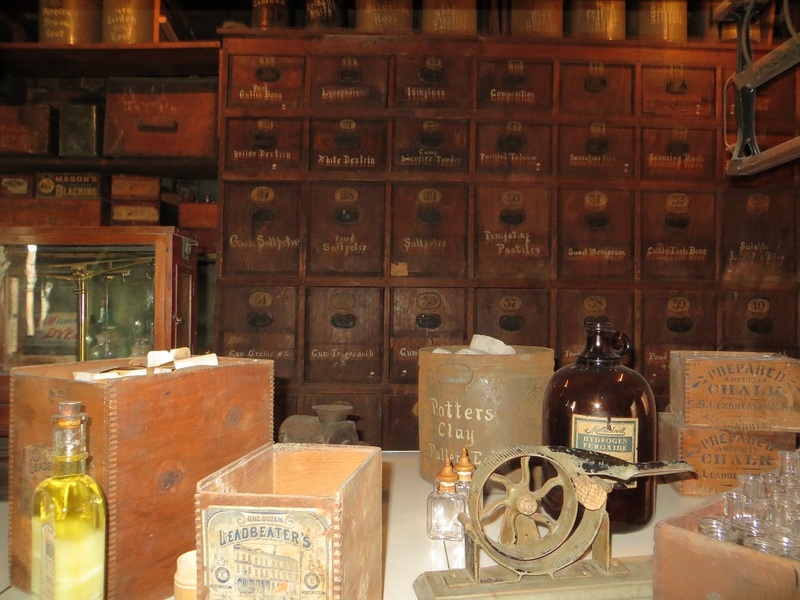 The Stabler/Leadbeater family ran an apothecary business in Alexandria from 1792 to 1933, attracting such customers as the Washingtons, James Monroe and Robert E. Lee. After the business went bankrupt, the building was sold to the Landmarks Society of Alexandria, which opened it as a museum in 1939. The really fun thing about the museum: much of it — especially the stores of medicinal supplies — has been left as it was when the shop closed. “What’s Dragon’s Blood?” asked a visitor as we wandered around their Potteresque manufacturing room, where plants and herbs and other materials were stored and medicine mixed. She pointed to a large, wooden box with ornate gold lettering on it, nestled amidst rows and rows of similar boxes. The docent took out a large book and looked up Dragon’s Blood. It’s a red sap from an Amazonian tree, spread on the skin to stop bleeding. The museum is tiny — just three rooms plus a gift shop — and you must take the tour to see it. But it’s an exceptionally interesting tour. It was supposed to go for 30 minutes but we kept the guide talking longer. He finally had to break away because he was the only person on staff and he had to give the next tour. Gallery | This entry was posted in Virginia and tagged Alexandria museum, Martha Washington, Stabler-Leadbeater Apothecary Museum. Bookmark the permalink. There’s an interesting apothecary shop in Fredericksburg, VA, too. Check it out if you’ve not done so. I haven’t. I’ve actually never seen much of Fredericksburg at all. I really need to get down there. Thanks. It really was. I had no idea that herbs could be so interesting. What an interesting tour – sounds like a neat place! I love that they left it as it was when the shop closed down. That really was the neatest part. Especially the storage area upstairs, where there were lots of dusty boxes partly filled with all sorts of crumbly things.